With all three moving averages now pointing lower yesterday’s down bar came as no great surprise, although it did finish the day with a shadows to the body both above and below, mainly due to the torrent of fundamental news released in the afternoon in the US. I hope you followed by suggestion yesterday to trade the short side, and my advice remains the same for today, and again we have a significant amount of fundamental news on the economic calendar in the US topped off with the important Treasury Currency Report due for a tentative release sometime this evening UK time. The only fundamental news specific to Canada is the new motor vehicle sales which are forecast to show a further fall in demand from +5.5% to -2%. These figures are taken as yet another sign of consumer confidence , or lack of it. I have covered the US news in more detail on the euro to dollar site. 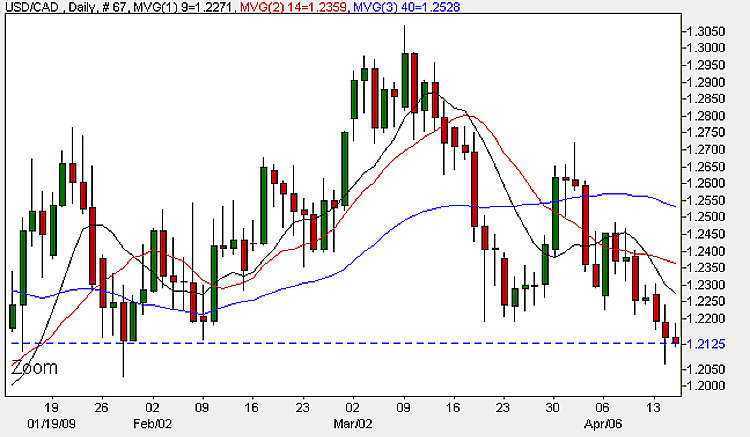 The significance of the break into the strong support area at 1.2185 yesterday cannot be under estimated and indeed this trend has continued in early trading this morning and looks set to break clear from this region which suggests a move lower to retest support at the 1.1814 price level, so my suggestion for the next few days is to keep looking for short positions with a view to holding these open over a longer period and moving your stop losses down accordingly to lock in any profits.